If you pay attention to emerging biotech companies, you might have heard of Sutro Biopharma. With a new way of making therapeutic monoclonal antibodies, the Northern California company has raised more than $90 million and just struck a major deal with Celgene. It’s a lot less likely you’ve heard of Invenra. But the Madison, WI-based company says it has a similar technology to Sutro: an antibody production system that doesn’t use genetically modified cells such as E. coli or Chinese hamster ovary cells as the factories, a break from the industry standard. “The plan was to stay low profile until the technology was ready and avoid all the distractions,” Invenra CEO Roland Green says. Now, with $4 million raised from friends and other angel investors, Green is ready to talk, and Invenra is just about ready to go work, first as a service company to help drug makers find therapeutic antibodies. Cell-free protein expression, as is called the method Invenra and Sutro use, still requires all the “goo” —the protein-making machinery—from inside cells as the growing medium. But it doesn’t require the cells themselves. Once the right mix is in place, the next key ingredient to add is the DNA of the desired protein. Much faster than conventional cell-based methods, cell-free expression has been available to researchers for years, but Sutro is likely the first biotech to scale it up into what could be a major therapeutic platform. Sutro chief scientific officer Trevor Hallam told Xconomy last month that its small manufacturing operation south of San Francisco was the start of a “potential future operating system” that could take products through commercialization. Now comes Invenra, which says it has figured out some advances to cell-free expression of antibodies, a particularly complicated protein. One advance, Green says, is the ability to express and screen hundreds of thousands of full antibodies—not just the small fragments that systems often use to winnow down their selection. Invenra’s Green was a cofounder of NimbleGen Systems, a Madison DNA microarray maker that Roche bought in 2007 for $272.5 million. (Other NimbleGen cofounders include Bob Palay, now the CEO of Madison’s Cellular Dynamics International.) Three of Invenra’s four directors have NimbleGen ties. Green says he wanted to take that “high-throughput mentality” from NimbleGen into a protein-based system. 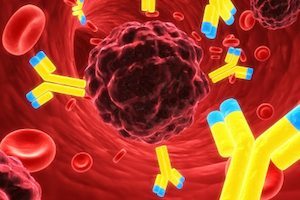 A big part of finding antibodies for therapeutic use is testing batches of them to find the few that have the best drug-like properties against the target in question—say, for example, a cell-surface receptor that tumors use to create blood vessels that enable them to grow. Once the full antibodies have been expressed, Invenra’s system can test much larger batches—hundreds of thousands—of them at a time “in very small wells” at much lower costs, Green says. They can test for target affinity or other characteristics, such as heat stability—the ability to withstand higher temperatures, which is important because protein structures can change and lose their drug-like properties. But Green is leaving the door open for the more ambitious plan of Invenra itself becoming a drug developer, not just a service company for other drug developers. “If you want to take your own candidate down the pipeline, in-house, you need deeper pockets,” says Green, referring to traditional venture investors, whom Invenra to date has avoided. Traditionally, biotechs with a platform technology have often used the platform as a stepping stone to becoming a drug developer. More recently, though, a couple antibody firms have remained service companies while passing the revenues back to their investors through creative business models. One of those companies is Adimab, whose CEO Tillman Gerngross told Xconomy in 2013 that the company was soon to post its first year in the black.